This is a photo I took of the Monument to Labor sculpture in Omaha, Nebraska, by Matthew Placzek. (larger version here.) It's a tribute to the workers in the labor unions that helped build Omaha and is the second largest labor memorial in the country. Here's a brief primer on Labor Day. Have a great holiday, this is an open thread, all topics welcome. The Rolling Stones and Guns 'N Roses singing "Salt of the Earth." Here's one of my favorite statue/sculptures, in downtown Omaha, at the Lewis & Clark landing, along Omaha's Missouri River Walkway. If you're ever there, it's well worth a visit. 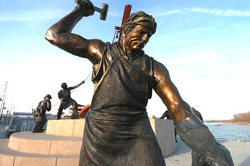 It's the second-largest labor monument in the U.S. Two-hundred-fifty tons of cement and 39,000 pounds of steel were used in its construction. It's by Matthew Placzek. Larger version here. I'm not starting my weekend until after a visit to the gym and then the jail. What are your plans? Today is Labor Day. If you aren't familiar with its origin and history, here's a primer. The observance of Labor Day began over 100 years ago. Conceived by America's labor unions as a testament to their cause, the legislation sanctioning the holiday was shepherded through Congress amid labor unrest and signed by President Grover Cleveland as a reluctant election-year compromise.